You will lose viewers over time, especially when they realize you just milk them like a cow. It is a waste of their time and contra-productive to your main goal: Adding value to their lives with your informative and entertaining content. 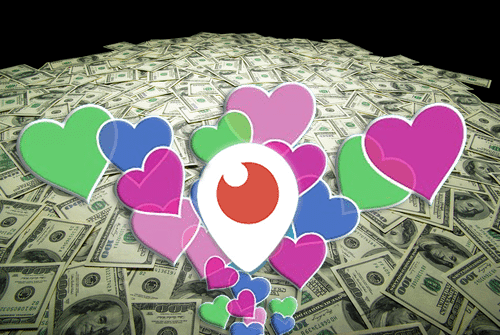 Hearts are overrated, as they won’t bring you more followers and viewers, as long as you are not part of Periscope’s Most Loved List (As of today, you need at least 22 MILLION hearts to enter this list). So what’s the real metric you should focus on, and how can you constantly increase it? Let your viewers eat your dessert first, which means, start your stream with your best tip. At the beginning, you will have the most people watching your stream, especially when you follow my 3 T’s of Success and my perfect intro pitch. After you have revealed your best information, you should ask your audience if they think this is useful by entering a thumbs up or entering the word “yes.”As it was your best tip, you will see positive feedback, which everyone can see, and this gives you credibility and trust. Now is the perfect moment to ask your viewers to share your stream with their followers on Periscope and Twitter, which will increase your reach and bring more people to your future streams. The best way to ask your followers for a share, and the advantages and disadvantages of the different sharing possibilities, I will publish at the end of this week, so make sure to come back soon. If you like my free content, please share it with your friends and followers. Thank you! 2) how to make skype spleetscreen broadcast? 3) where to watch your old recordings? youtube? Thank you for your comment & feedback. 1) If the connection is poor, there is not much you can do but trying it again. 3MB upload should be anyway enough. I did streams with 1MB upload streams.